Dave Kempson took over as CIO at Maricopa Integrated Health System in Phoenix, Ariz., at a very interesting time — not only was Maricopa transitioning away from being a county-owned facility, but the IS department was in need of a major overhaul. Kempson and his team were tasked with creating a truly integrated system, and because Maricopa had experienced IT failures in the past, the pressure was on to deliver the goods. What Kempson learned is the vendor many peg as the most expensive might be the best bet in the long term, that Rome was not built in a day — or even in one phase — and that for government organizations, the vendor selection process can be more complicated. We really wanted to find a vendor we could partner with strategically that could meet the large share of our needs on both sides and give us a system where the data would be integrated between the two sides. Maricopa Integrated Health System has in its history a couple of large IT system failures, and we felt—and our board felt—that we could not survive or sustain one of those here, so we really wanted to make sure that with whatever system we picked, we were going to be successful with our implementation. A lot of people never really bought into the decision, and the organization struggled with using the system for many years. So we felt it was important to have a more open and engaging selection process. I would hope that Meaningful Use is kind of an added benefit to doing it rather than your main driver, because one of the things you need to be careful of when you’re implementing a system like this is to spend the time to make sure that your people—their attitudes, their hearts, and the processes that they’re doing—and the technology are all aligned together. Guerra: Good morning, Dave, thank you for joining me. I’m looking forward to chatting with you about your work at Maricopa Integrated Health System in Phoenix. Guerra: Alright, to start off, give us the lay of the land. I know it’s a large complex health system with a lot of components, inpatient and outpatient. Give us the brief overview. Kempson: For the public safety net system for the Phoenix metro area, we’ve got two hospitals: an acute care hospital in downtown Phoenix and a behavior health hospital in Mesa, a nearby town; 11 family health care centers and primary care clinics; and a large multi-specialty clinic located on our main campus. We have the regional burn center that covers all of Arizona, southern Utah, southern Colorado and New Mexico. And then we’ve got an in-home attendant care program that’s part of our in-home nursing business venture. Guerra: Approximately how many acute beds in total? Kempson: We have about 500 licensed beds, of which about 350 are staffed. Guerra: As far as the physician mix, what are the approximate numbers of employed versus credentialed community doctors? Kempson: All of our docs are contracted with a single provider called District Medical Group. They provide our inpatient and outpatient physicians. Guerra: So you don’t have independent community physicians that refer in? Kempson: We do have some independent physicians that we’ll refer into the system, but they’re not privileged within the hospital. So if a patient gets referred either to our specialty clinic or, for whatever reason, for a surgery, they’ll be taken care of by a different physician here. It’s kind of a unique model that we have right now. We’re actually looking at changing it and going to more of a standard community based physician model, but as it exists right now, it’s a closed medical practice. Guerra: Interesting. Tell me a little bit about your application environment—your inpatient system, your main clinical system, and what you’re using in some of the clinics. Kempson: We’re in transition right now. 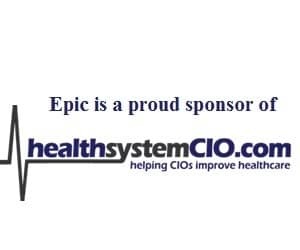 Historically, our organization was on McKesson Star as a primary system, and we’re transitioning over to Epic. We are live with Epic in our entire ambulatory sector and in our three emergency departments—we have an adult ED, a pediatric ED and a burn ED—as well as our peri-operative suites. We’re in the process right now of implementing Epic on the inpatient side, both acute and behavioral health along with the ancillaries, and our go-live date is in March of 2012. Guerra: Did you have anything on the outpatient side in the practices? Kempson: We were using McKesson Star both for registration, billing, and scheduling and clerk order entry. We were primarily on paper from a charting standpoint. Guerra: When did the organization start going down this road of looking at possibly switching from McKesson? Kempson: I would say it started in late 2005 or early 2006 when we developed an IT strategic plan that included a transition on the application side. It wasn’t until 2008 that we actually awarded a contract and started moving forward. Guerra: When did you join the organization? Kempson: I came on board in March of 2005. Guerra: Okay, take me through that. Did you come in and look at things and say you wanted to move in a different direction? Kempson: There were kind of multiple moving parts at the same time; our organization used to be a county hospital and we were a department of Maricopa County. What happened was the county decided that they wanted to get out of the healthcare business, and ultimately, through negotiation with the legislature, the whole idea of whether or not the hospital and the health system would stay open went to the voters. It went in the form of basically asking the voters if they would approve a tax levy on property tax to support a special healthcare district—which would be basically a state district—underneath the legislature, pulling the hospital and the clinics outside from underneath Maricopa County and creating this district with its own elected board. Voters approved it, so in 2005, that transition happened. At the time, I was working as a deputy CIO for Maricopa County, and the hospital needed an interim CIO basically to come out and help with the transition, so I was assigned to do that. That was in March of 2005, and in July of 2005, I was appointed by the CEO as the permanent CIO. During that transition period, the board was interested in laying out strategies, both on the business side and on the technology side, as to how we were going to transition and really improve, so my team and I basically took the lead in developing that IT strategy. So interestingly, the county wanting to get out of healthcare for a long period of time had under-capitalized the organization, so infrastructure both on the IT side and the facility side was hurting—it was very outdated. It was rare to find a PC newer than five years old in the fleet. So those first couple of years, the plan focused on all aspects of infrastructure, applications and governance—the first two years were really focused on the governance side and the infrastructure side. It was that third year, 2008, that we really started to move forward on the application side. Guerra: Tell me what your thought process was at that time—what prompted a switch, what were you looking for, had you had any exposure to Epic before, and were you inclined to look at them? Kempson: Epic was still kind of new. They had a couple of major clients; Kaiser obviously being one of them. I think at the time, the market was more heavily oriented towards Meditech and Cerner. I personally had heard a lot of good things about Epic and knew that I wanted to at least take a look at them. What was really driving us was the desire to have an integrated system between the outpatient and inpatient side. So we knew that we didn’t want to go with a best-of-breed or a best-of-suite. We really wanted to find a vendor we could partner with strategically that could meet the large share of our needs on both sides and give us a system where the data would be integrated between the two sides. So that narrowed the field extensively. And when we did our RFP, we only had six or maybe seven vendors that actually made it to the first stage of consideration, because we were requiring them to be able to have an integrated billing, scheduling, and inpatient and outpatient system. Guerra: Was McKesson in the running to retain the business? I don’t know if Horizon Clinical was out at that time or if it was Star. Kempson: McKesson was certainly invited to bid, and I think they made a strategic mistake in how they bid it, because they didn’t bid their new product lines. They basically continued to bid Star as a foundation and kind of a slow transition, if you will. Maybe they were trying to do that from a pricing standpoint—to keep the pricing down and be competitive that way. But in the end, they didn’t make it into our final three. It was Epic, Meditech and Cerner that floated to the top for our final selection. Guerra: With Meditech, did LSS come up as an issue? Kempson: Yeah it did. Obviously LSS was the partner that they brought to the table for the outpatient side. We did a pretty extensive total cost of ownership analysis between the three finalists and it somewhat surprised us, because we had heard from everybody that Epic was the most expensive and that it’s great, but nobody can afford it. Well, when we really compared apples to apples, Cerner was more expensive than Epic over seven years, and separating Epic and Meditech over the first seven years was under $10 million. I mean $10 million is a good chunk of money, but we really weighed what we were getting with Epic that we wouldn’t get with Meditech, and whether that investment was worthwhile. Ultimately, we decided that it was. When we did site visits, it was really clear that the Epic sites were very satisfied with their product, that their implementations—although all implementations are high risk—had a very good history of going very well; that Epic was a product and a company that was really poised to meet the new changing demands of the market. It was clear to us that when they launched a product, they would make improvements to that product very quickly, and the time for an enhancement on the Meditech side to float through the process was much longer. We just felt that going with Epic was not only a good choice for now, but clearly a better choice for the long term. Guerra: Anything more specific relating to the decision to go with Epic over Cerner? From what I understand those are two really integrated systems, inpatient and outpatient. What are your thoughts on the Cerner product? Kempson: Sure. So a couple of things drove that. First of all, one of the big issues was the fact that the revenue cycle pieces of Cerner did not score well in our process. The revenue cycle team basically said that they couldn’t use them; that if we chose Cerner, we would have to bring in a third party to manage the revenue cycle pieces, so that was pretty big. Cost obviously was a big issue, because when we did that TCO over seven years, Cerner was more expensive even than Epic, and we didn’t feel like there was enough added value by Cerner to justify that. Then the third piece was, as we did our site visits and began to talk with the community, there were numerous examples of Cerner implementations that went sour. Maricopa Integrated Health System has in its history a couple of large IT system failures, and we felt—and our board felt—that we could not survive or sustain one of those here, so we really wanted to make sure that with whatever system we picked, we were going to be successful with our implementation. We just felt that Epic was much lower risk than Cerner in that regard. Guerra: You talked about looking at this in 2008; maybe you can define that a little bit more closely for me. When I look at the dates here, I look at 2008 and I look at a possible go-live in mid-2012 and it strikes me that these things take a lot of time. Can you drill down on that time line and tell me if they really do take that much time, and talk about what the implications are in terms of Meaningful Use for places that may not be very far along. Kempson: Well, they absolutely take time, and I would say that for a large government system like Maricopa, they probably take more time than they would for maybe a smaller private or non-profit hospital. Just from the procurement standpoint, we have a more stringent set of rules and regulations that we need to follow to make sure that the selection is done properly in accordance with state procurement law. But even that aside I believe one of the things we did right is engaging a broad base of stakeholders in our selection. When Star was put into Maricopa a good 10 or 15 years prior, it was a decision that was made in a vacuum. And I think a lot of people never really bought into the decision, and the organization struggled with using the system for many years. So we felt it was important to have a more open and engaging selection process. From the time we decided we were going to move forward with a selection process to the time we actually awarded a contract was about a year and a half. You can do it faster than that, but we felt it was important to take our time, and that the benefits we gained by having that more engaging process would be worthwhile. So we signed a contract I think in early 2009, but then when we looked at an implementation, we had the option of doing a big bang like some of the other organizations had where everything gets implemented at once, or we could spread it out into phases or stages. Honestly what drove the decision to spread it out was a cash flow issue—we didn’t have the financial power to do it all at the same time, but retrospectively, spreading it out also offered a lot of advantages that we’re now reaping. Doing all of ambulatory in the first phase was a really smart idea because the ambulatory environment is the feeder to the inpatient environment. So getting them up to speed and spending the time and resources to do that right has really positioned us to do the inpatient side. We’ve been able to increase volumes on the outpatient side, we’ve been able to increase revenues on the outpatient side—all of those things are helping us transition on the inpatient side. So when we looked at it, we basically said we’re going to break this thing up into three phases. The first phase would be outpatient, and then because we had significant pain points in ED and OR, we threw those into phase 1. Phase 2 was going to be the inpatient side with the ancillaries including CPOE, and phase 3 was going to be kind of a clean-up and optimization mode bringing in some areas where we already had pretty solid systems. For example, with outpatient pharmacy, we already have a pretty solid system; we pushed that off to phase 3 knowing we were going to go with Epic in the long run, but that it could wait. Cardiology is another example where we have existing systems that are pretty much meeting our needs. We know we want to integrate it, but we can put that off until the end. So we basically came up with this strategy to implement the three phases over a five-year implementation timeline. For people who are interested in going down the same path for Meaningful Use, it could be done faster, but there are risks with doing it faster. With the timeline for hospitals like us who are on the Medicaid timeline, there is no need to rush, because they let you spread that reimbursement out over a longer period of time. I’m concerned for the Medicare incentive on the inpatient side because once you qualify for stage 1, you have a two-year clock that starts where you have to be qualified for stage 2. And for those hospitals that are doing that this year with the stage 2 rules not set to be finalized for another 12 to 18 months, to me that’s risky, because 12 or 18 months from now, you find out what stage 2 is, and now you only have six months to meet it. To me, and again, I’m glad again from our side that we’re applying for the inpatient incentives this year, we’re going to wait until we’re live on Epic and qualify for those next year. We’ll have a little bit more time on that Medicare side to make sure we’re ready for stage 2. Guerra: So you took some time with this and did it in stages because of financial considerations, which every other organization is going to face as well because the incentives, as we know, are back-loaded. Other organizations that are starting now don’t have the luxury of spacing it out for financial reasons—they somehow have to come up with all the money now. You also said you were able to take advantage of that time to lay more of the groundwork to give your organization a greater chance of success once you did turn on the systems. Is that correct? Guerra: It’s just so concerning for organizations that began this when Meaningful Use got started. Kempson: Right, especially large organizations. Smaller organizations can be more agile; they can get through even the selection process faster just because there are less people and less politics on the physician side to deal with. But if Meaningful Use is your main driver for doing it, then that becomes a concern. I would hope that Meaningful Use is kind of an added benefit to doing it rather than your main driver, because one of the things you need to be careful of when you’re implementing a system like this is to spend the time to make sure that your people—their attitudes, their hearts, and the processes that they’re doing—and the technology are all aligned together. One of the things that we experienced was that implementing on the phase 1 side required a significant transformation in the way that everybody who is using the system—regardless of whether they’re clinical or support—required a significant change in the way that they do business. If you’re going to slam something in and you’re not going to spend the time to do that right, I think you’re going to have a negative financial impact that more than offsets any revenue you might get from Meaningful Use. People need to be careful and not let Meaningful Use be the primary driver of moving forward. Guerra: In your work implementing Epic and getting ready for Meaningful Use, have you seen a danger of patient safety issues if these things aren’t done right and deliberately and cautiously? Kempson: Anytime you’re addressing changes in workflow and changes in behavior from clinicians, you’re going to have risks to patient safety. Interestingly, the EMR has created some new patient safety issues that didn’t exist prior; but at the same time, it’s resolved some patient safety issues and mitigated some issues that we had before. Looking at examples of that, with the HER, we’re able to do medication checking against a patient’s existing med list and automatically put up alerts when there’s a conflict. That clearly will help avoid mistakes that might have been made if that alert wasn’t provided. On the other hand, Epic and all of the HIS vendors aren’t perfect, and they have bugs or flaws in their system. In Epic’s case, they call them PSEs or Patient Safety Escalations, and when we implement something and we count on it being safe and then we get a PSE signaling that there’s actually a bug in the system, we have to adapt to that. It’s been interesting the way the risk management arm of our organization has had to really change the way they handle things because of this new concept of PSE that didn’t exist before.